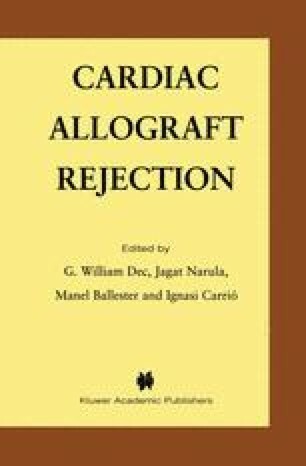 Acute cardiac allograft rejection is a complicated immune process principally mediated by T cells. T cells recognize major histocompatibility complex (MHC) antigens via direct or indirect pathways. MHC antigens also play a major role in the destruction of transplanted tissues by activated killer T cells. Since MHC antigens and minor histocompatibility antigens participate in many facets of organ rejection, they are called transplantation antigens. MHC antigens are divided into two categories, class I and class II, according to their function and structure. Normal, nucleated, nonlymphoid cells such as cardiac myocytes express low levels of MHC class I antigens and do not express detectable levels of class II antigens.1,2 MHC class II antigens are normally expressed only on lymphoid cells and antigen-presenting cells such as macrophages, monocytes, vascular endothelial cells, and Langerhans cells in the skin. Once T cells are activated, they produce a variety of cytokines that act on cells in the vicinity. Among these cytokines, interferon γ is a potent cytokine that induces expression of MHC and other adhesion molecules not only on the antigen-presenting cells but also on non-professional antigen-presenting cells including vascular endothelial cells and cardiac myocytes3,4 (Fig1). Though their physiological roles in the induction process are still obscure, class II antigens are key elements in the control of the immune response to antigen, functioning in the recognition of antigen by regulatory T lymphocytes.